The bathroom in my New York apartment was so small your knees would touch the sink if you were sitting on the toilet. When I moved from Atlanta to New York, my family loved to joke that now you could brush your teeth while on the toilet! 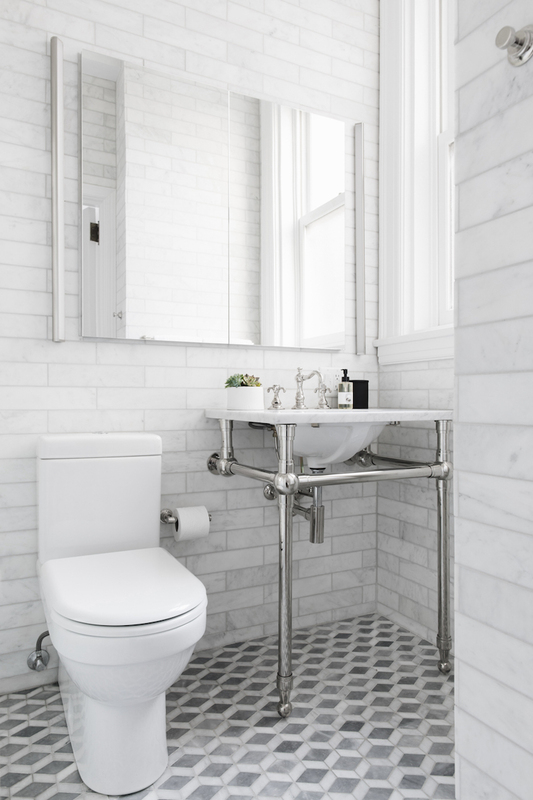 Small bathrooms can be one of the hardest spaces to design and balance function with style (not to mention all while accommodating construction codes!). And, let's face it the options are limited if you're not looking to do a pedestal sink. Enter: console sinks. The Marlton Hotel in NYC is one of my favorite examples of a small space bathroom packed with style and function. A few years ago, we stayed here for New Years and after sharing the bathroom with three people for a few days with minimal complaints -I knew they had something right - the console sink paired with a mirror and marble shelf running the full length of the room and the extra storage underneath it. And hooks, always a lot of hooks. Before integrated plumbing, a washstand and bowl was a common sink set up. Console sinks styles date back to some of the first integrated plumbing and were intended to look like furniture. I think they are a classic look because of it and really bring the style to a small room. Surprisingly versatile in traditional design schemes or modern, the high style and old world glam is never lost. With our house being built in the late 1920s, this style sink is a top contender for our downstairs bathroom. The 'old world' looks feels like the perfect fit for our with enough versatility to work with a more transitional design scheme.